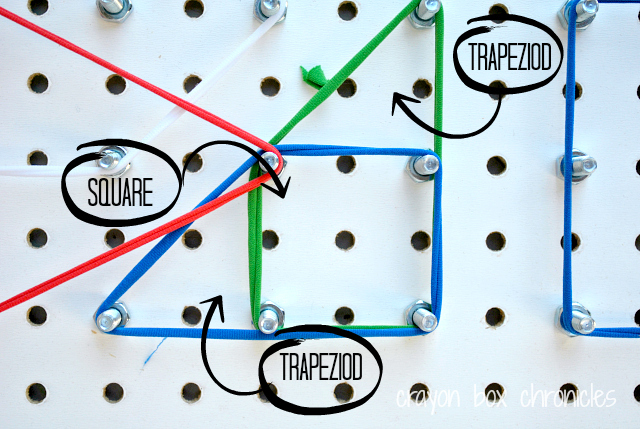 Trapezoids, squares, and right triangles, oh my! We love finding interesting ways to learn shapes and colors. 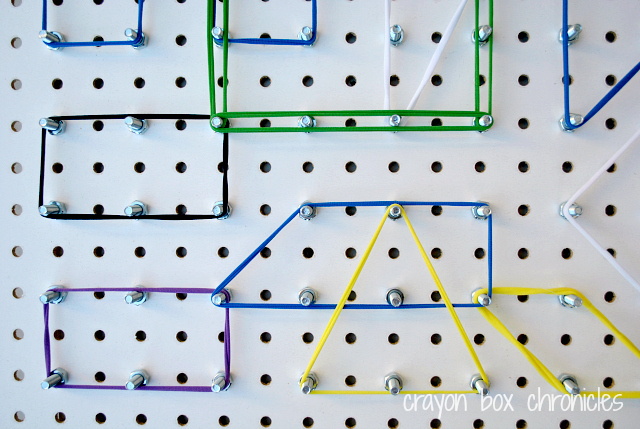 Our DIY geoboard is durable, educational, and sets-up in a snap. This project has been a long-time coming for me, probably two years. I wanted to wait until C was three and had a basic understanding of shapes. He’s fanatical about shapes and colors, so I knew he’d gravitate to it! Boy, ow-boy was I right – he loves it! 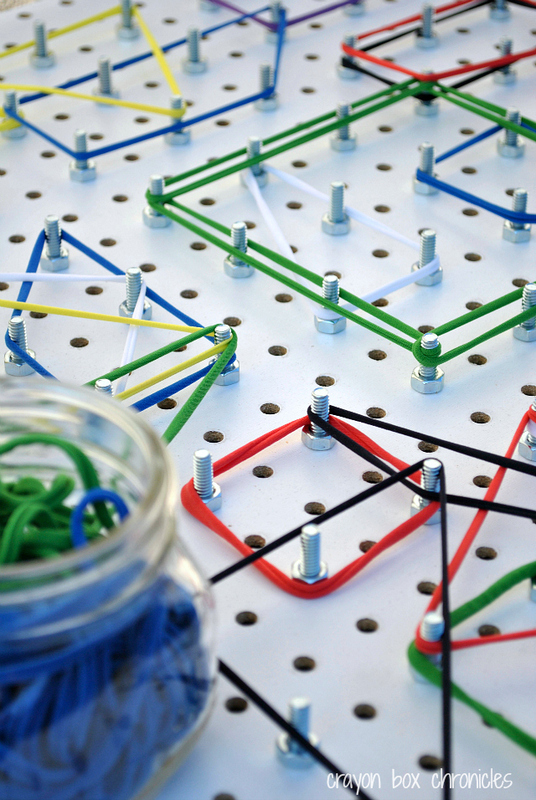 As a child, my favorite toy was a geoboard, so I think I’m just as excited. 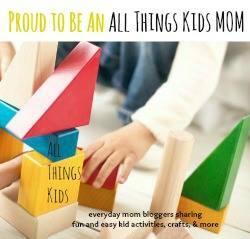 Do you ever find yourself playing with your kids toys? 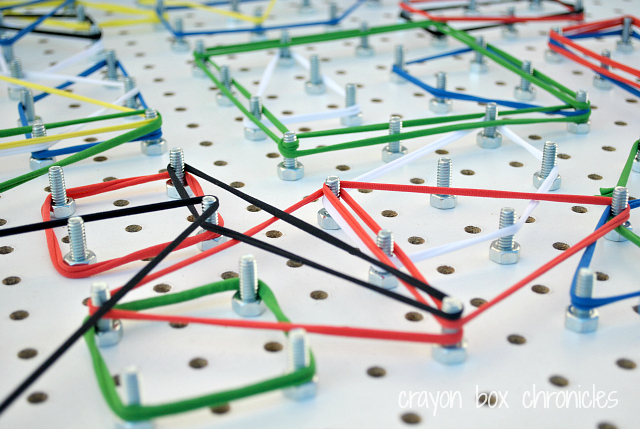 A geoboard is a manipulative tool used to explore basic concepts in geometry such as shapes, angles, measurement, area, and perimeter. 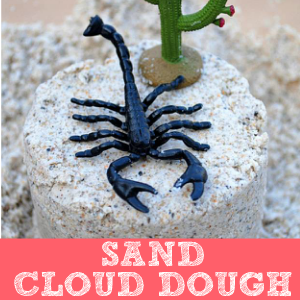 Plus, they’re just plain old fun! Developing early mathematical skills will help children with problem solving, critical thinking, and learning spacial awareness. 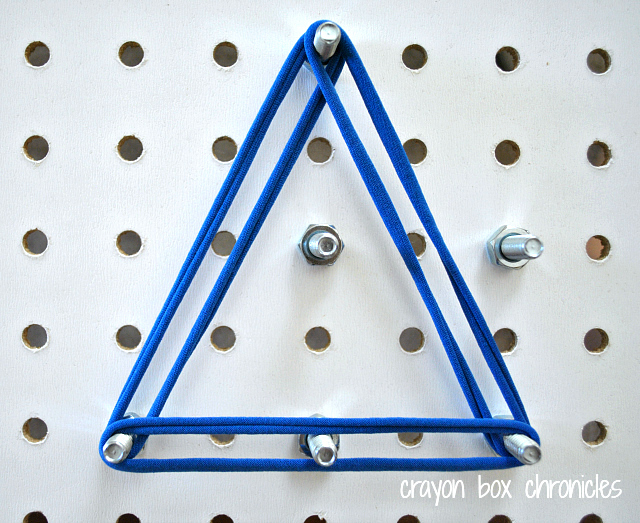 Geoboards challenge fine motor skills and hand-eye coordination. 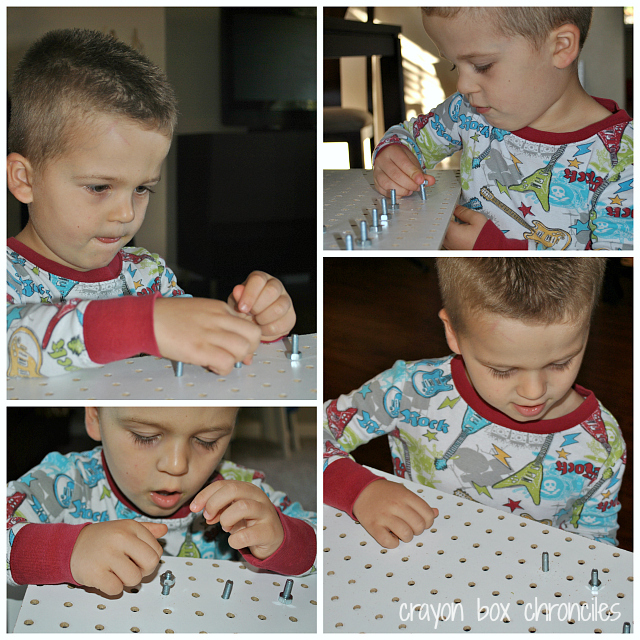 We purchased our pegboard, screws, and nuts from Home Depot. The peg board comes in 2′ x 4′ white panels ( 23-3/4 x 47-3/4). Home Depot will cut it for free too! We cut in-half to equal 2 – 2′ x 2′ panels. 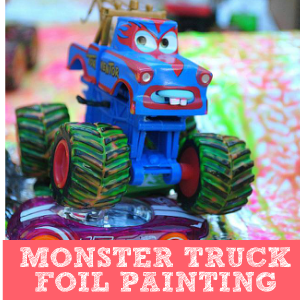 Save the other half for another fun project such as reorganizing your craft supplies, garage tools, or kids art supplies. 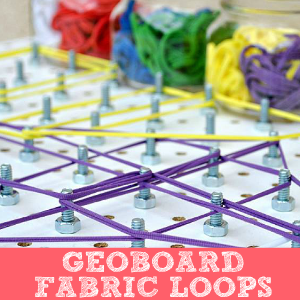 Remember fabric loops? 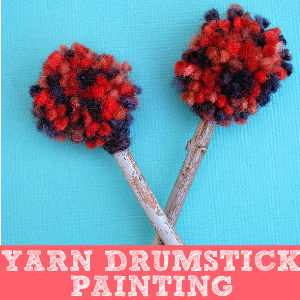 I recall weaving them into bracelets as a kid. They’re durable, soft and for us, safer without the SNAP! As he progresses, rubber bands will be a great option too. We purchased our fabric loops at Michaels, sorted them by color, and stored them in Ball half-pint, wide-mouth jars. 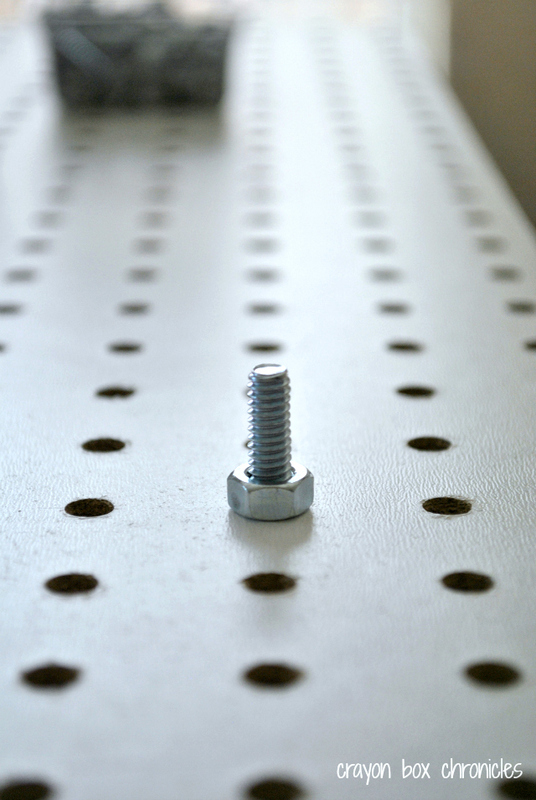 To begin, insert the screw from the bottom of the pegboard through the holes and screw the nut on top of the board (white side). Skip a row and repeat until finished. We used 100 screws total, leaving 3-4 holes on top and bottom empty. Be sure to securely fasten them and re-tighten frequently. That’s it! Sort your loops and create. After letting him explore, I reverted his attention back to setting up the rest of the board. I was pleasantly surprised at his excitement to assemble the blots and nuts. “Twist, twist, twist Mommy” he replied! 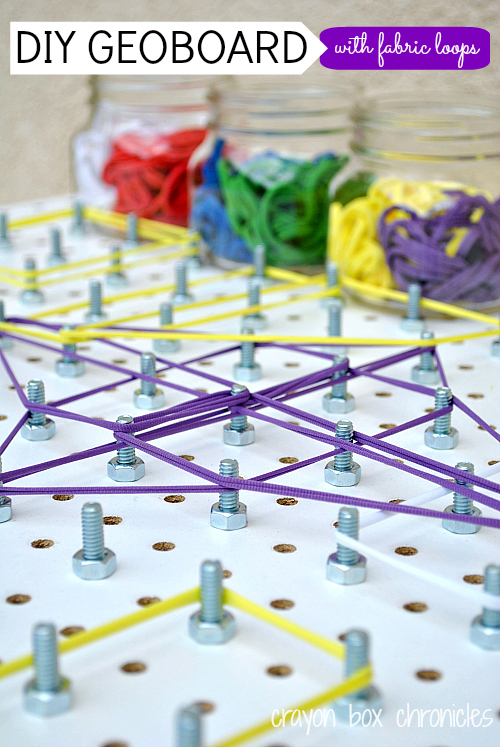 Love the fine motor boost. Once the board was complete, he immediately began creating shapes at different angles. He really likes rectangles. While watching him explore shapes and angles, I noticed he created two overlapping trapezoids and unintentionally made a square. When he realized it, he was filled with excitement! It was amazing to see his reaction and all from a few bolts, nuts, and fabric loops. He continued creating shapes at different angles and within each other. Show a square with 5 square units. Show a square with 10 square units. 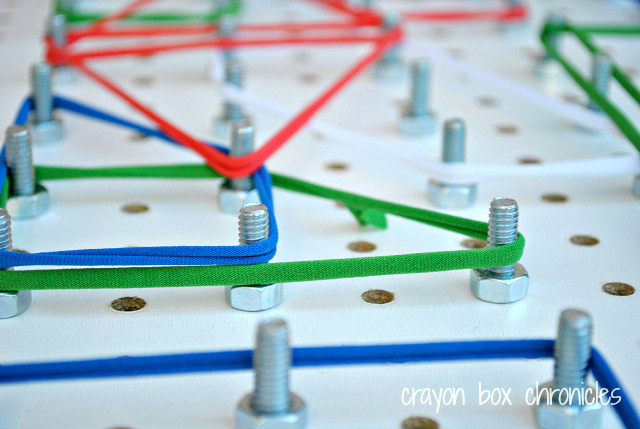 Geoboards hold a special place in my heart from my childhood, so we’re all equally excited to play with it. I would spend hours playing with mine a kid. 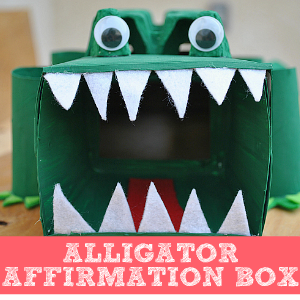 Do you have any special childhood toys that you’ve introduced to your children? 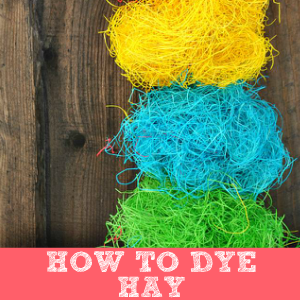 He took all the fabric loops out of the mason jars, then back in, identifying each color. After he finished playing, we hung it on the wall and closed up the jars. He can easily open the jars and play at anytime. It’s removable too, so he can play either on the floor or wall. Always supervise your children during play, especially with possible loose parts and metal objects. 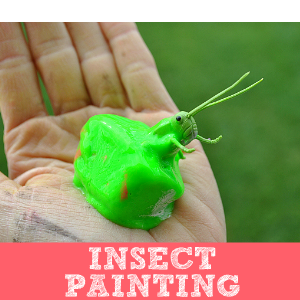 This activity is not age-appropraite for all children. Please use your own discretion. 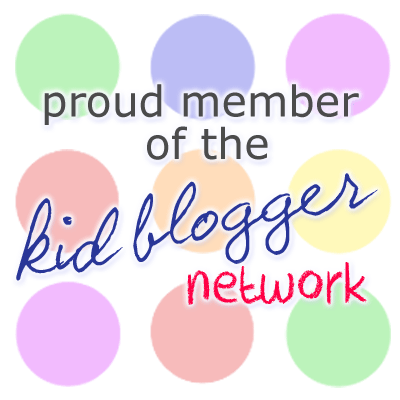 Looking of more fun, creative, easy kids crafts & activities on Pinterest? Love it! 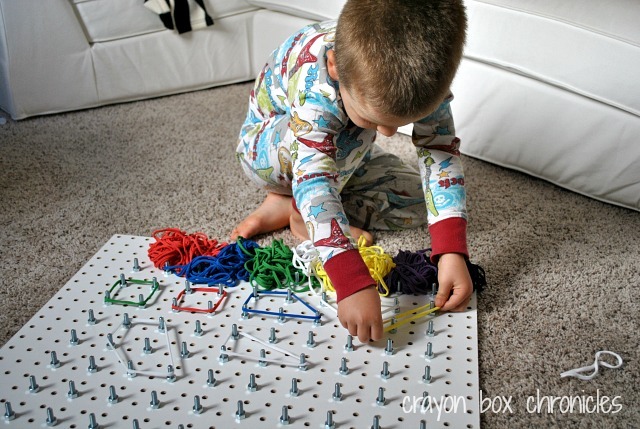 Our preschool has the plastic pegboards, meant for rubber bands, but there are so many problems for putting it out–choking hazzards for our children that are special needs and possible rubber allergies… I LOVE, LOVE, LOVE the idea of using fabric loops! SUPER! 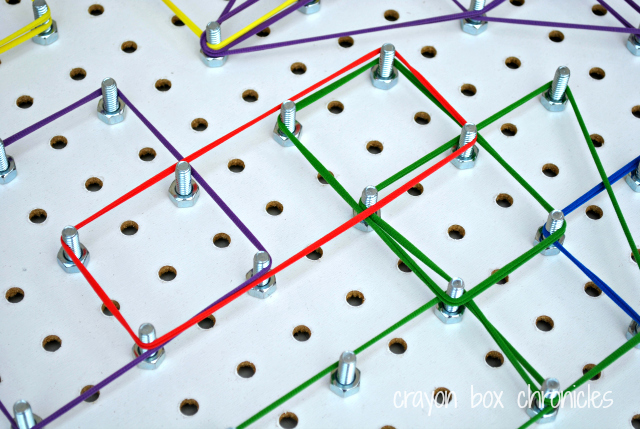 Pingback: 21 Geoboard Activities for Kids - The Ultimate Guide for Art, Math, & Fun! Yay! Thank you. I think I love it just as much. 😉 Enjoy your weekend!